As I was walking out to hop on my bike after school today, I noticed a man leaving at the same time. I smiled, balancing my bookbag on my shoulder, and said, “Hello”. “I don’t know how you do it; I couldn’t have your job. Clock in, clock out, I like not having to think about work at the end of the day,” he laughed back as I juggled my papers to grade, coffee mugs to wash and combination on my bike lock. “Yeah, I would like that, too,” I responded instinctively, smiling as he walked towards his car. Pedaling home, I thought about my response. What would I like about not having to think about work after the teaching day ends? Is it the constant reflection that happens on my 15-minute ride home? Would I prefer to have my boundaries so clearly drawn that my work and personal life never intersected? How is that even possible? I’ve been accused of ‘living in my head’ since I was a little kid. I’m a thinker, an introvert, an observer. In my childhood, I didn’t like to talk and only responded to certain folks in my small social circle. Part of it was definitely shyness, but also my discomfort at sharing my thoughts before I’ve had a chance to sit with them. My ‘thinking routines’ involve identifying a concept or topic, curiously digging in to find out more about it, swishing it around in my mind, comparing nuances, sorting through pros and cons, and then cautiously making my thinking visible. Sometimes that comes out through my writing, and more often, lately, it comes out through my voice. I’ve been working on making my thinking routines. I think about those kids in my classes, who just like me, have difficulty blurting things out. They have so much more swimming around in their heads than they let show on paper. They would rather be misunderstood than push themselves to communicate publicly – often resulting in academic grades that are lower than they should be. These students have inspired my work to help them make their thinking visible. I’ve become somewhat obsessed with the work of Visible Thinking, of Trevor Mackenzie and Rebecca Bathurst-Hunt (see below for their exciting new book, Inquiry Mindset), and Simon Brooks’ work on Thinking Routines. I nerd out reading research and strategies and wondering how I can create a student-friendly version to help my students flex their thinking muscles. It’s going to take some thinking on my part. I’ve got to be the ‘behind the scenes’ creator who is plotting, strategizing, and making it seem as if these routines were inside them all along. It’s part of the magic of being an educator. My English 7 classes are reading Refugee by Alan Gratz as part of the Global Read Aloud this fall (a mind-blowing book, by the way), and after our initial dive into the topic of refugees, their brains were definitely more curious and primed for learning. The next step is harnessing that curiosity with another thinking routine called Creative Questions. I made a hyperdoc to help them explore their ‘wonders’ more deeply – you can check it out here. I spent hours on Sunday morning diving into the Cultures of Thinking I found on the Rochester Community Schools website. Educators in Rochester are doing some amazing, inspiring work on thinking routines that are pushing me to be more creative and intentional with my inquiry practice. Please say tuned for more thinking routines inspired by them, created by me, and shared with you! Are any of you using thinking routines with your students? I’d love to collaborate/share/create with you! 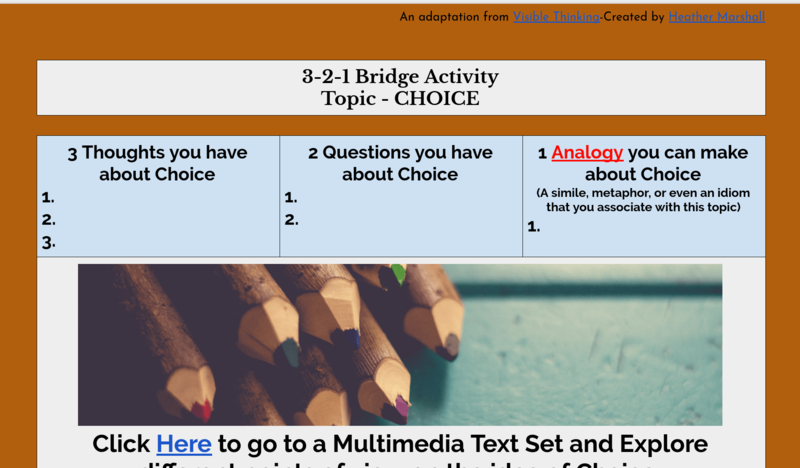 Feel free to adapt my hyperdocs to meet the needs of your students. All I ask is that you just share them back, please, so I can see how amazing you are! And please drop me a note in the comments, or message me on Twitter @mamawolfeto2 – we are so much #bettertogether!